When the PCs witness their hometown of Phaendar destroyed in the first steps of an all-out war of conquest, they begin a quest that leads them from desperate survival to heroes of legend as they push back against the monstrous Ironfang Legion. This ruthless army�helmed by the hobgoblin General Azaersi and empowered by an ancient artifact known as the Onyx Key�intends to claim both Nirmathas and Molthune while the isolated nations bicker with one another. The heroes' quest will take them deep into the fey-haunted Fangwood Forest, to the craggy bluffs of western Nirmathas, and delve deep into the earth to explore the Darklands. Can a small band of refugees grow into champions and push back against Azaersi's horde, or will the Ironfang Invasion give way to an Ironfang nation? The Ironfang Invasion Adventure Path calls back to classic adventures, focusing on exploring the unknown and confronting the fantastic, all to stop a monstrous enemy from wiping out the good people of Nirmathas and Molthune. The PCs will delve into dungeons, siege well-guarded keeps, explore the wilderness, and battle some of the most iconic creatures from the 40-year history of fantasy RPGs. The Ironfang Invasion Adventure Path launches with "Trail of the Hunted," a tale of desperate survival set against the invasion of a ruthless hobgoblin army�the Ironfang Legion! As the Ironfang Legion begins carving out an empire of monsters, the heroes must flee their hometown of Phaendar as it burns, saving any lives they can. The heroes guard their band of survivors in the wilderness, challenge a troglodyte tribe for safe haven, and face the brutal bounty hunters dispatched to end their flight to freedom! 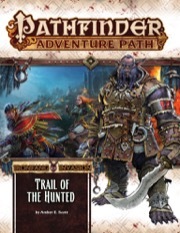 "Trail of the Hunted," a Pathfinder adventure for 1st-level characters, by Amber E. Scott. A bestiary containing new regional threats and allies, by Crystal Frasier, Amber E. Scott, Tonya Woldridge, and Linda Zayas-Palmer.